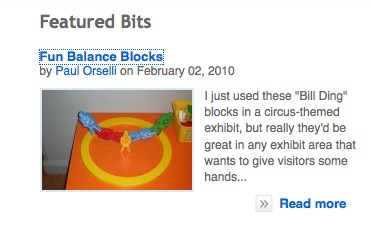 The already excellent ExhibitsFiles (a community site for exhibit designers and developers to share their Reviews or Case Studies of exhibits or exhibitions) has added a new tab to its homepage called "Bits." So why not do your "bit" for ExhibitFiles and submit a Bit today? Not an ExhibitFiles member yet? It's simple and easy to sign up by clicking here.